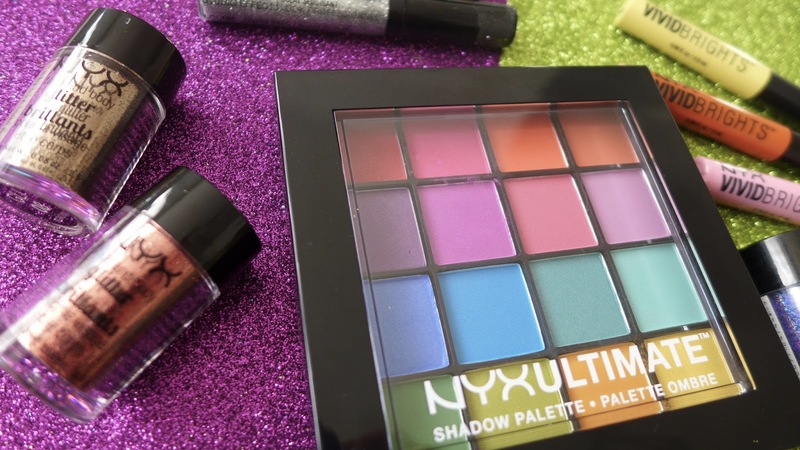 I was over the moon when NYX Cosmetics stands started popping up in Boots all over the UK and can easily spend AGES lusting over all of their gorgeous products until Conor has to drag me away. Everything they do is so damn on trend and pretty, I just want it all! 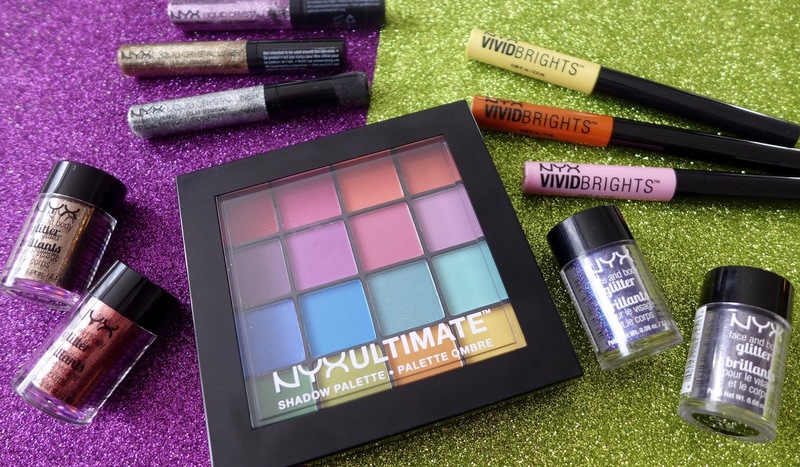 I've been a fan of theirs long before they showed up here in the UK and treated myself to a few of their products in America as a rare treat, but now I confess I'm a fully fledged NYX Cosmetics addict and hence there were a LOT of their products on my Christmas list this year. Here's the newest additions to me make-up bag! I kind of let out a little squeal when I found these the first time. I've gotten far too deep into the makeup artist side of Instagram and have been searching for some affordable glitter to try and recreate some of the incredible looks I see these guys pull off. 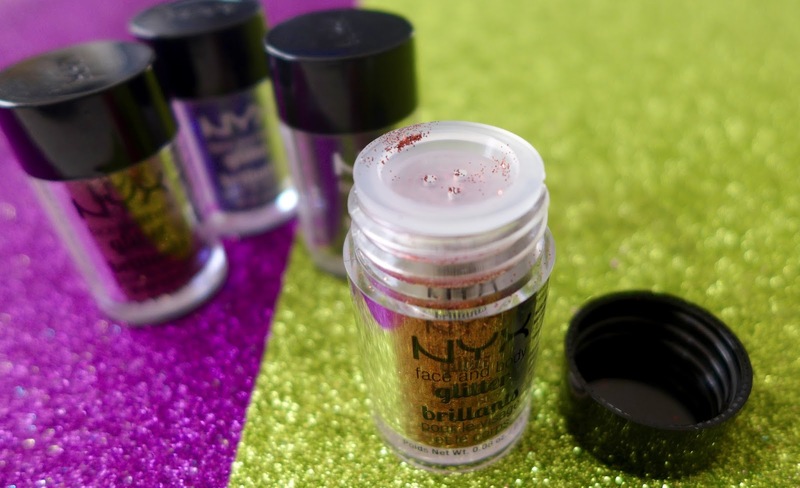 I treated myself to Gunmetal, a gorgeous black/grey mix and Violet, a sharp purple, first off and then my mummy bought me Red and Copper from the NYX Face and Body glitters to kick off my collection. The glitters are so fine and beautiful, the colours are absolutely popping and don't require too many layers of application to create a banging look! The little pots come with a plug stopper to stem the flow of the glitter so you don't end up glitter bombing yourself, but personally I found this restricted the flow too much. Thankfully whoever designed this thought of that and the stopper is removable. Honestly the application of this was a little tricky. OK, admittedly I haven't got my hands on the official NYX glitter primer yet and had to make do with some of my own that I had lying around. The glitter went on OK but as soon as I closed my eyelid it kind of went everywhere and immediately ruined my look. I'm reserving judgement for now though until I try the official stuff and see how that pans out. The colours are to die for though! I've kind of exhausted myself when it comes to lipsticks now (who am I kidding, but humour me) so I've been focussing more on expanding my eyeshadow collection. Honestly, I stumbled across this incredible little palette completely by accident and was immediately in love. 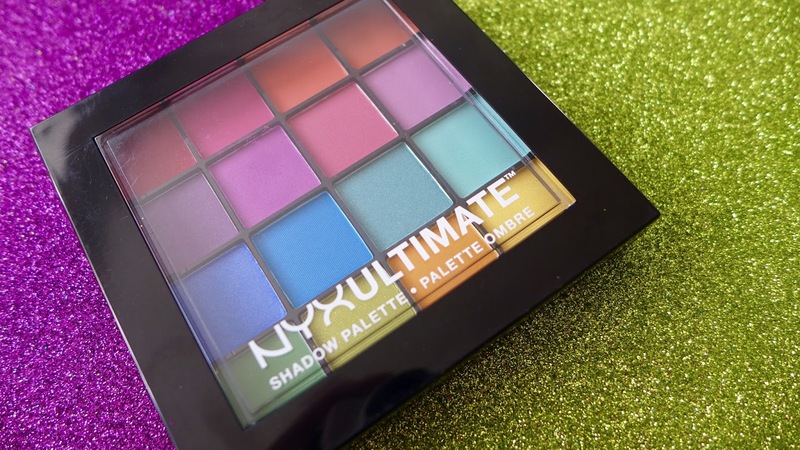 The perfect mix of mattes and shimmer in the most GORGEOUS colours, I opted for the NYX Ultimate Shadow - Brights palette. I've got nudes coming out of my ears and was in definite need of some more colour in my life, and not those random pinks, purples and occasional dark greens you find spattered around palettes these days. I wanted something with real BITE and damn if I haven't found it! Not only are the colours really one of a kind they're all ridiculously pigmented (I took a pic but for some reason it blurred when I uploaded it so you'll have to take my word for it!) 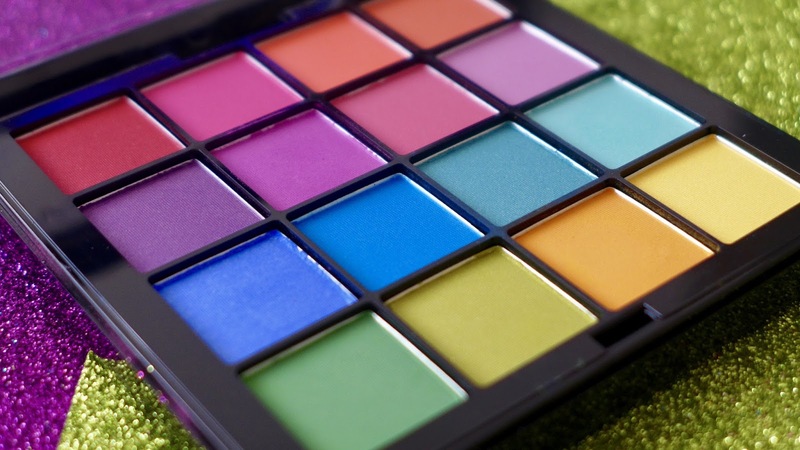 - literally every colour is as bright and opaque as they appear in the palette so they really make an impact. And to make matters even better they blend like an absolute dream! I've been having so much fun experimenting with some rainbow eye looks these past few weeks. Although I'll not be giving up my standard black liner any time soon, I've been wanting to get my hands on some different colours to play with for a while so I grabbed some of the NYX Cosmetics Vivid Brights. 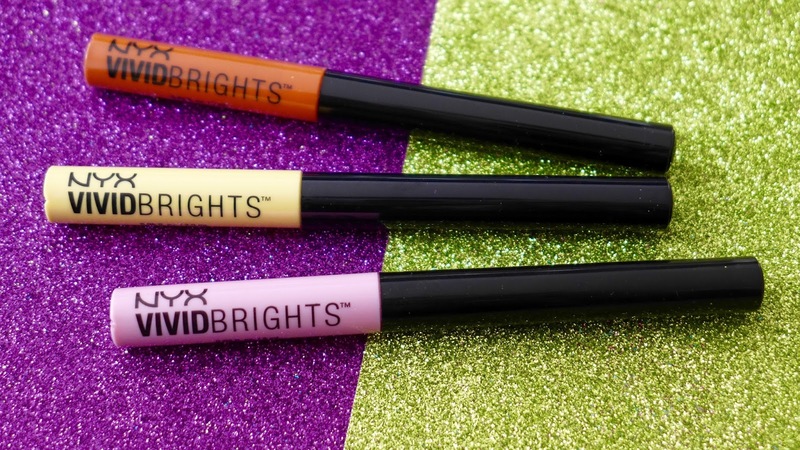 They're matte eyeliners in a gorgeous selection of extremely bright, opaque matte colours. I got my hands on Halo, a custardy yellow colour; Petal, a bubblegum pink colour and Delight, a coppery red colour. 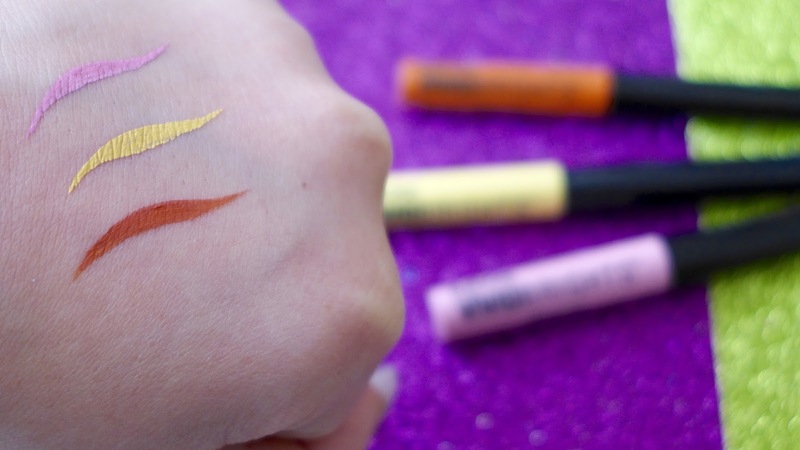 The consistency of the liners reminds me a lot of matte liquid lipsticks: full coverage with one application and a quick drying matter finish. The colours really pop and you don't have to use much product to get the result you're after. The application wand is long and thing, which is great from precision. The only nitpick I'd have is that the actual brush hairs are slightly too long for me so I've trimmed them down for accuracy as it was a little too fiddly before, but now they work perfectly and I can't wait to get my hands on the rest of the colours in the range. 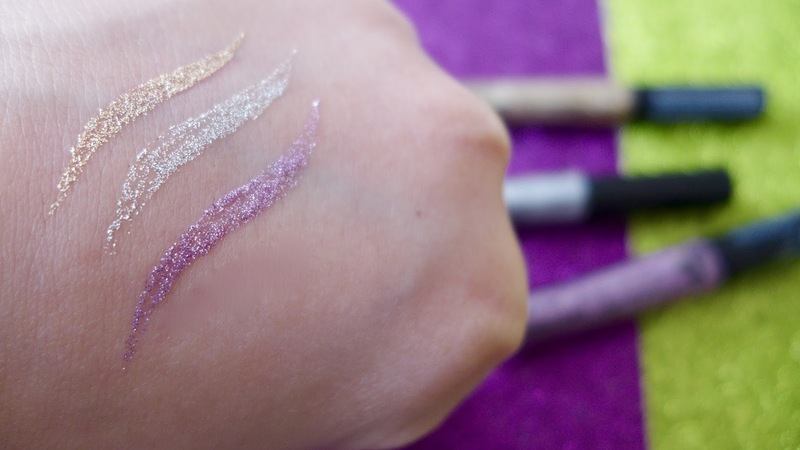 I've been after a dupe of the Urban Decay Heavy Metal Glitter Liner for ages now (I just don't want to pay £14 for something I will rarely wear!) 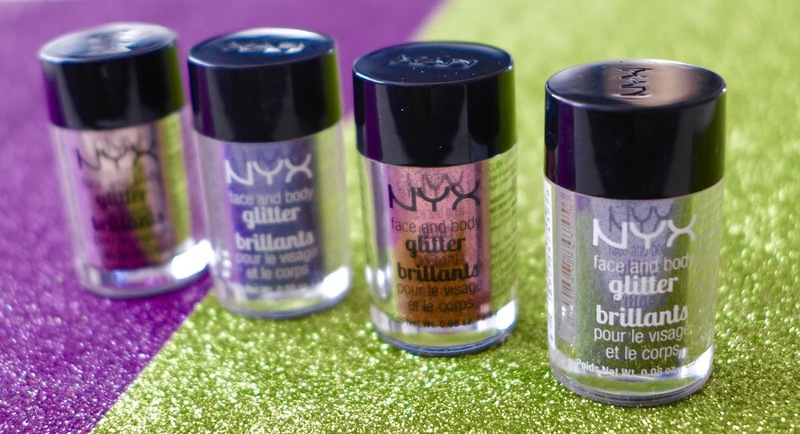 so I died when I found these little beauties from NYX for half the price. 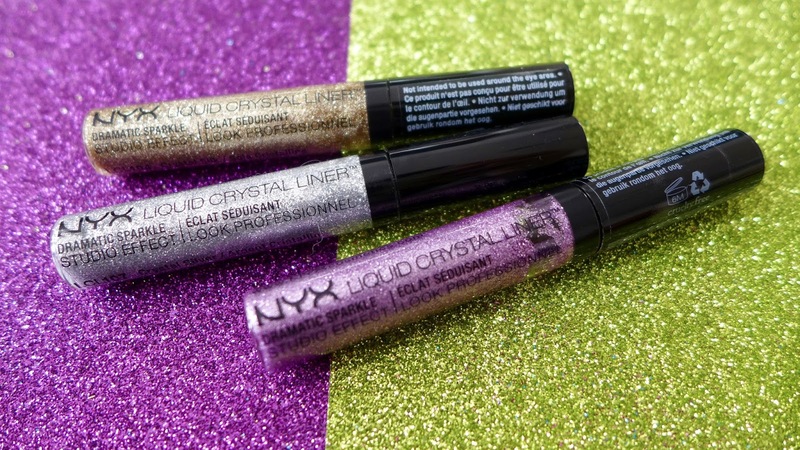 The NYX Liquid Crystal Liner is exactly what it says on the tin - a sparkly liquid eyeliner to jazz up your eye look! 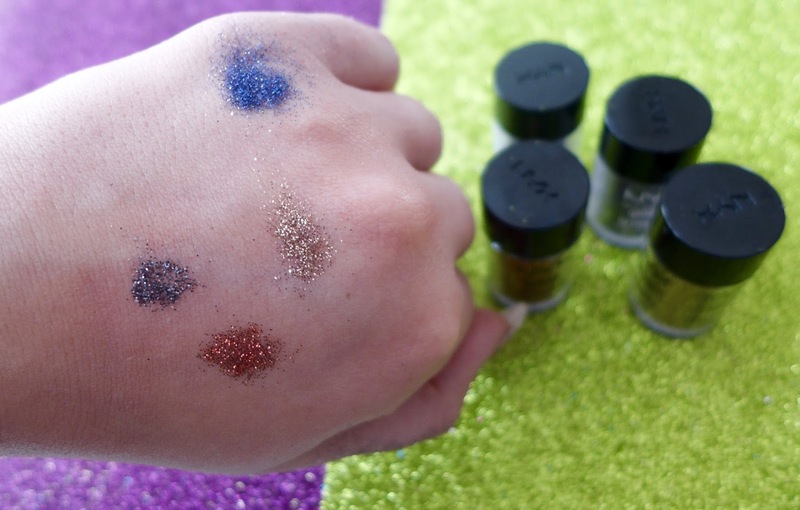 The glitter particles in the formula are very fine, the same as those found in the Face and Body Glitter. I opted for Gold, Silver and Pink to start off my collection as I reckon these will be the colours I'll use the most. Similarly to the Vivid Brights, the applicator was a little fiddly at first, but I've trimmed it down and it's much easier to handle now. Unlike the Vivid Brights however, these do take a few applications before you get any opacity. From the first stroke it was clear that whilst it looks packed with glitter in the bottle, once it's on your face it's actually quite diluted so a few coats are needed to bulk it out a bit. The great news is these are incredibly long wearing. They dry completely solid and are actually quite hard to budge once they've settled! That's it for another beauty haul! 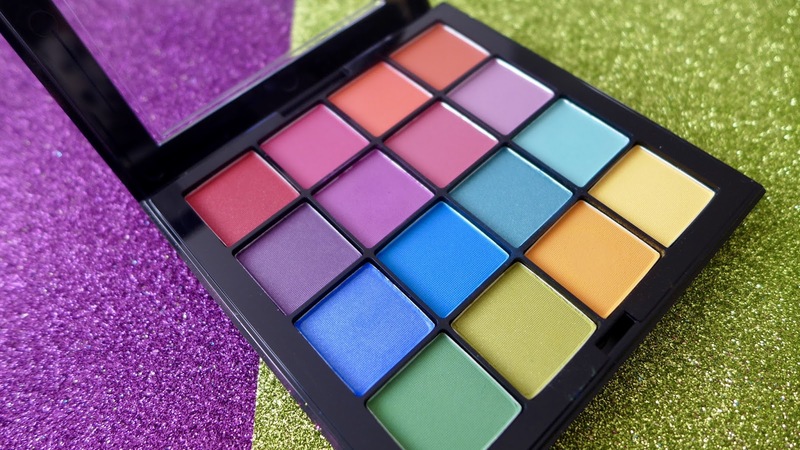 I absolutely love that NYX Cosmetics are available on my local high street now and I'm thrilled to be expanding my make-up collection into more unusual and experimental products at reasonable prices (although I can definitely see this getting out of hand! ).